A joint team from Hokkaido University and Keio University has identified a gut protein essential for neonatal mice to fight infections, according to research published in the Journal of Experimental Medicine. The insight could help understand how infants develop their own intestinal immune systems after weaning. The gut is constantly exposed to potentially harmful bacteria that come with food and is home to naturally occurring intestinal bacteria that help fend off pathogens and produce vitamins. To maintain a healthy balance, microfold cells or ‘M’ cells in the gut lining absorb antigens, which are foreign molecules from outside the body. This absorption triggers production of antibodies, which bind to and neutralize pathogens. In the current study, a group led by Shunsuke Kimura of Hokkaido University, and Nobuhide Kobayashi and Koji Hase of Keio University found that a protein called Sox8 was specifically expressed by M cells. Using florescence and imaging techniques, they also found that the protein was present in both young and mature M cells, indicating its consistent involvement during the cell development stages. Furthermore, the team found that Sox8 directly promotes the production of an antigen receptor, GP2, that is only found in fully matured M cells and enables antigen uptake. 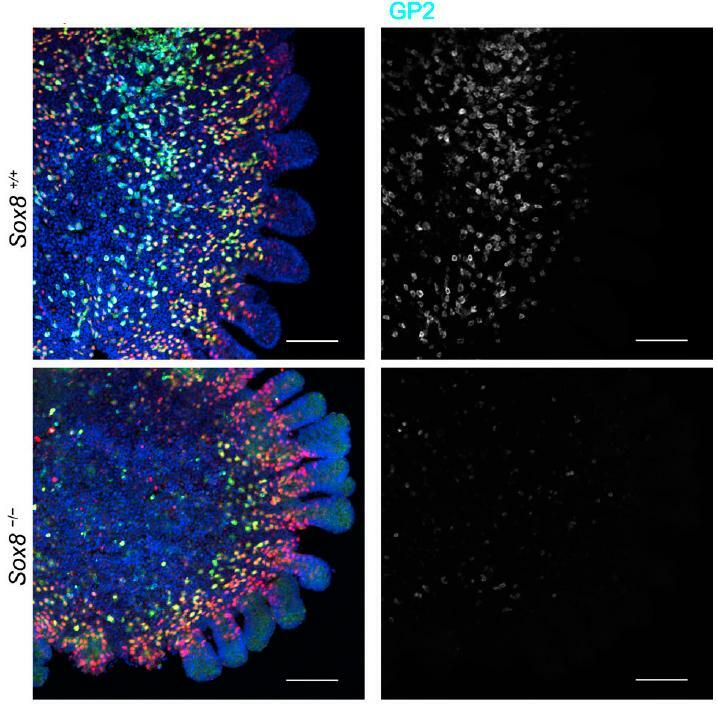 Conversely, lack of Sox8 in mice led to reduced expression of GP2 and therefore reduced antigen uptake, suggesting that Sox8 is responsible for the maturation of M cells. In the mice lacking Sox8, production of antibodies was significantly reduced one week after weaning, indicating that the protein is indispensable for the immediate establishment of immune system after weaning. “Future studies should investigate genes regulated by this protein in order to completely understand the molecular mechanisms underlining the intestinal immune system,” says Shunsuke Kimura. “We hope that our study may one day help develop preventive measures such as vaccines against gut infections among infants,” Koji Hase added.